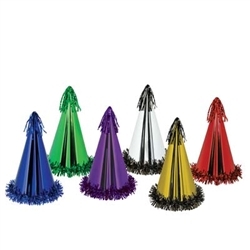 Get the party started with these Assorted Fringed Foil Party Hats! The Assorted Fringed Foil Party Hats come in brilliant shiny red, gold, silver, purple, green, and blue. Each has fringes that match the color of the hat on top and bottom. Perfect for any party whether it be birthdays, graduation, or Mardi Gras. Each package comes with 25 hats. Looking for more multicolor birthday party accessories, then check out the assorted happy birthday latex balloons or the happy birthday beads. Beautiful large party hats. Very nice colors and fringe!! I only wish the chin straps were a little more sturdy---they broke easy.